Chemo brain is the phrase used to describe the cognitive impairment that follows chemotherapy. Symptoms are predominately related to confusion and memory problems. Mental impairment from chemotherapy is also referred to as chemo fog or cognitive dysfunction. Although studies haven’t confirmed if these symptoms are directly due to chemotherapy treatment, many cancer survivors say otherwise. Regardless, it’s one of the many frustrating emotional side effects of undergoing cancer treatment. Chemo brain and Vaccines: What do they have in common? Vaccines contain neurotoxins, including aluminum, mercury, formaldehyde, MSG, and antibiotics, among others. The very definition of a neurotoxin is a substance that is damaging to nerve cells, the main component of the human brain. Therefore, it’s safe to assume that these so-called ingredients in vaccines can cause cognitive impairment – similar to the symptoms of PCCI. Consider the flu shot. Each shot contains the neurotoxic heavy metal mercury, which is proven to cause permanent damage to the brain. This is the same toxic substance found in metal amalgams, or silver fillings. 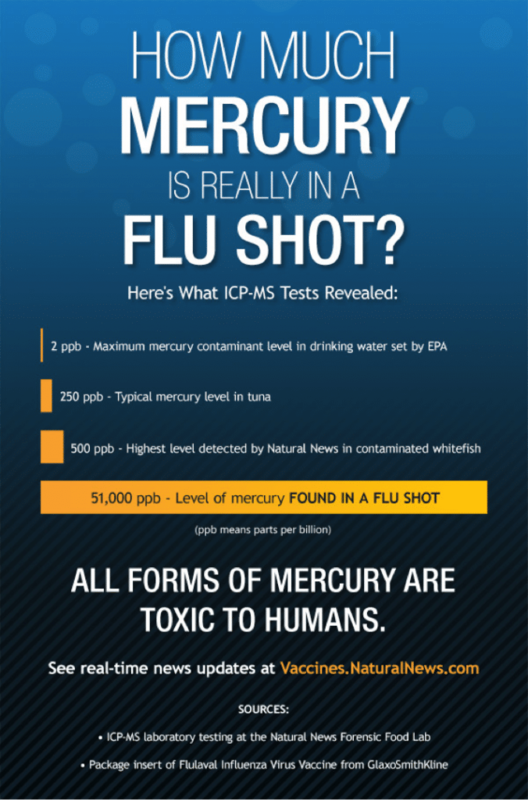 If you’re wise enough to avoid vaccines due to the damaging effects of mercury listed above, it’s time to make the switch and visit a holistic dentist. Holistic dentists prioritize the removal of mercury-ridden dental fillings. Not only are these dangerous to the body upon insertion, but they have also been shown to release toxic mercury vapor over time. Unlike a flu shot, where you’re exposed to a high level of mercury once, silver fillings expose you everyday for the entirety of their existence inside of your mouth. The International Organization for Standardization (ISO) and the Food and Drug Administration (FDA) outline what they call “safe” for various dental procedures. Unfortunately, though, many materials like mercury known to be unsafe to the human body slip through the cracks. Why would they allow neurotoxins to be used as the main component of silver fillings? Mercury is a substance that has been grandfathered into the current list of safe materials since it’s “substantially equivalent” to the ingredients approved before 1976. Regardless of the FDA’s grandfather clause, holistic dentists care about eliminating toxins from their procedures without compromising the health of your teeth. In fact, many biocompatible materials are just as successful at filling and restoring teeth as toxic alternatives. Mercury damages many brain functions in very similar ways that chemo brain works to deteriorate cancer patients’ alertness. Paralysis, delirium, motor skill loss, and incoherent speech are common from methylmercury poisoning. Aside from mental impairment, damage to the lungs, heart, kidneys, and nervous system can be side effects of prolonged exposure to mercury. You may erroneously assume you’re free from mercury if you avoid eating too much fish – but a dental amalgam is the greatest source of mercury vapor outside of industrialized settings. That means no matter how you shift your diet, you could be suffering from methylmercury poisoning until you undergo silver filling removal to rid your body of this harmful mixture. Unless you must endure chemotherapy, there’s no reason to suffer from the cognitive impairment associated with vaccines, mercury, and dental amalgams. Miami holistic dentist Ted Hermann specializes in mercury-free dentistry. Discuss your options by contacting a member of our front desk at 305-274-0047, or read more about our philosophy here.